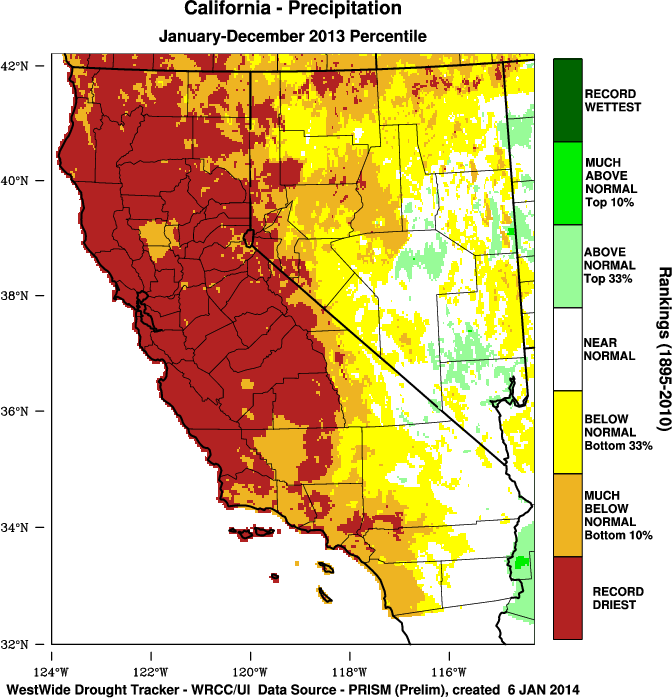 Extraordinarily dry conditions have persisted over the entire state of California since early December. In fact, nearly the only measurable precipitation that fell during the past 30-40 days occurred today, when a rapidly decaying cold front brought light to locally moderate rainfall (and snowfall in the high Sierra) to the far northern part of the state. In normally very wet locations along the North Coast, half an inch or so of precipitation fell, but totals were almost categorically under a tenth of an inch elsewhere and didn’t even tip the buckets from the Sacramento/San Francisco area southward. Needless to say: today’s minimal precipitation made no measurable dent in the ongoing extreme drought and was not even enough to settle the dust in most places. Folsom Lake on January 4th, 2014. Photo credit: Adam Flint . As hard as it is for seasoned California weather-watchers to believe, our friend the RRR remains in firmly in place, and has actually intensified somewhat in recent weeks. I’ve previously discussed how the truly remarkable aspect of this event is the incredible persistence of the observed geopotential height ridging over the northeastern Pacific Ocean rather than their absolute intensity. Blocking ridges and persistent high surface pressure centers are actually a fairly common feature of the climate over the North Pacific region in winter, and it’s well understood that these blocking events are often associated with periods of dry and stable weather along the West Coast of North America, including California. For this reason, Californians are not at all unaccustomed to mid-winter dry spells lasting 2-3 weeks, even in the heart of the rainy season. But the RRR has behaved in a manner not typical of most North Pacific ridging events. Since December 2012, large geopotential height anomalies have been observed in approximately the same region of the North Pacific. While the spatial structure of the ridge itself has varied somewhat over that interval (and even broken down in a couple of instances), the RRR keeps re-building itself in essentially the same place each time an atmospheric event–such as a surge of low-latitude westerly winds with the potential to “undercut” the ridge or an invasion of a cold/high potential vorticity Arctic airmass with the potential to disrupt the anticyclonic circulation–might otherwise act to displace or collapse it. This resilience is extremely unusual, and (as mentioned in a previous post) I don’t find evidence that persistent North Pacific ridging of this magnitude spanning two consecutive winter seasons has occurred previously in the observational record. The plots below clearly show that the RRR was present during the both the previous (2012-2013) water year and the present (2013-2014) one, and even persisted in some form during the intervening late spring through early fall 2013 period, which corresponds with California’s dry season. Note that the scale for the most recent plot goes much higher than the previous two: the RRR has strengthened substantially since the start of winter. Just how bad is the current drought situation in California? the peak of the rainy season in California, and each day that passes without meaningful precipitation is another day when our long-term deficits grow measurably larger. The first annual Sierra snow survey on January 7th brought no surprises: snow water equivalent on that date was only 20% of normal overall, and considerably less than that in the north where much of the reservoir capacity resides. Over the past few days, negative snow anomalies have continued to increase, and preliminary data suggest that (as of 1-10-2014) Sierra snow water equivalent may be at its lowest level ever recorded for the date. This suggests that the dryness of the 2013-2014 water year so far is similar to (or worse than) that experienced during the 1976-1977 water season. This assertion is also supported by looking at the Northern Sierra 8-Station Index, which is considered a representative metric of precipitation across this hydrologically critical region. Considering the extreme dryness of the second half of water year 2012-2013, it’s no wonder that that 2013 smashed so many all-time low precipitation records in California. 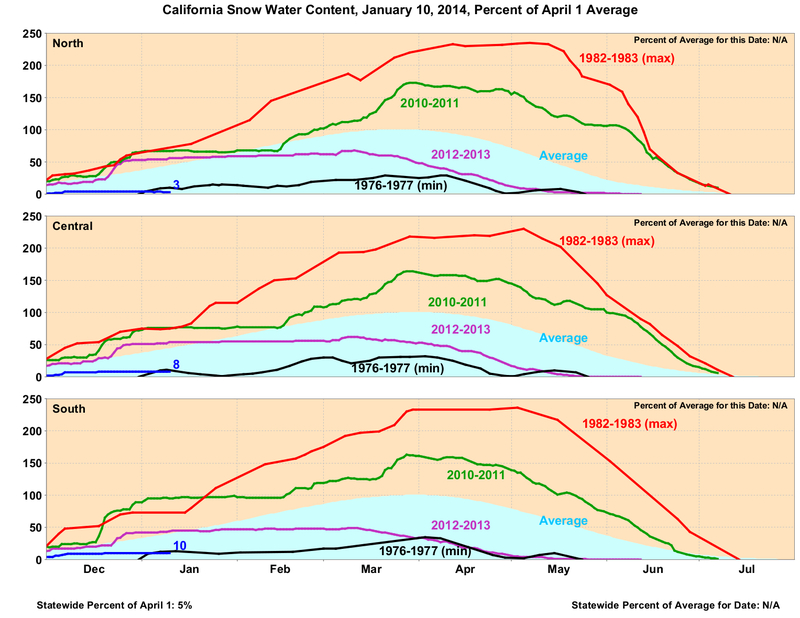 Sierra snow water equivalent as of 1-10-2013. (CA Dept. of Water Resources). 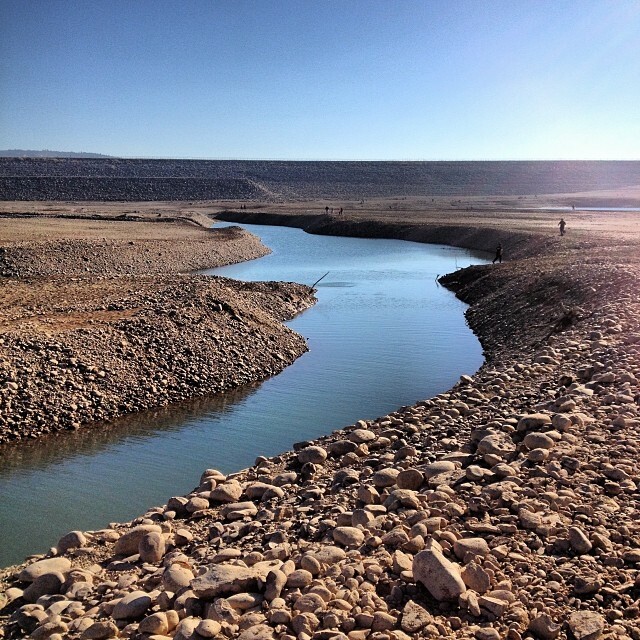 Reservoir levels in California have been falling rapidly since summer 2013, but these extremely low water levels are finally making headlines as some water districts are already facing difficult choices and the potential for severe water usage restrictions. Folsom Lake has become something of an icon of the ongoing drought in California as its water level has dropped precipitously to one of its lowest levels in history (see photograph near the top of the post, courtesy of Adam Flint), imminently threatening the water supply for suburban Sacramento. Numerous other smaller water districts, from the Central Coast up through Mendocino County, are facing or will soon face similar conditions. A wider water crisis is still a little way down the road, but if California does not receive widespread and very substantial precipitation over the next two months, many communities (especially in the northern and central parts of the state) stand to face water shortages of a magnitude not seen in the modern era. ECMWF have come into increasing agreement that ridging will rebuild and further amplify over the next 7-10 days, with the most recent GFS ensembles suggesting persistence clear through the end of January. While there does appear to be a more active zonal jet developing over the Pacific, its orientation does not appear to be extremely favorable to either undercut the RRR or significantly dislodge it, and may actually be contributing to the extreme amplification of the ridge expected to occur next week. Current numerical model solutions indicate that the jet stream will make a huge latitudinal excursion all the way from the subtropical Pacific to above the Arctic Circle by the middle of this week, bringing very warm and continued dry conditions to California. Dangerous fire weather conditions are expected across most of Southern California due to the warm temperatures and offshore flow associated with this event, and there will probably be an elevated risk of extremely rare winter wildfires in the northern part of the state, as well. In short, there’s no relief in sight for at least the next 7-10 days, and very possibly longer than that. Stay tuned.